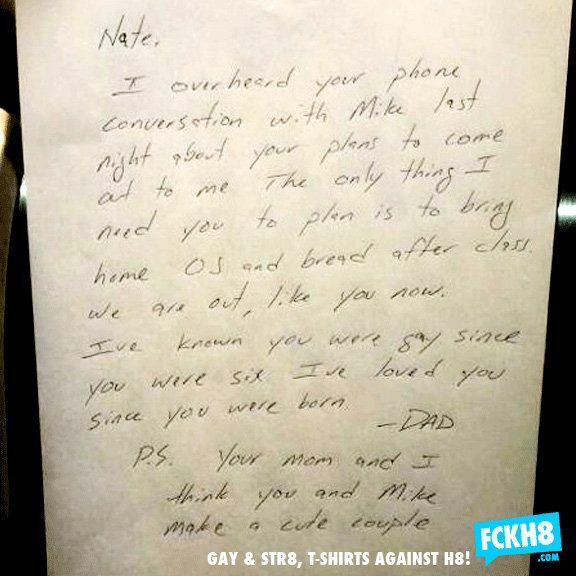 3/15/13 by Beth Greenfield- A letter written from a dad to his gay son Nate is going viral on the Internet because of its simple, hopeful message of love. He said Nate’s family did not want to share any information besides the letter itself. But the four sentences alone have been enough to inspire a bit of an online frenzy. “It’s actually sad so many people are excited about it,” Mongtomery said. “And what I think that says is, one, it’s rare, and that’s really bad. And two, people are really craving this kind of reaction.” The website founder, a 39-year-old gay man who has a strained relationship with his Christian fundamentalist parents—especially since he drove around the country in a “Legalize Love” campaign in support of Obama last fall—was personally touched by the note’s simple, powerful message. The national organization Parents and Families of Lesbian and Gays (PFLAG) also saw the letter and loved it.